Nobody likes going to funerals, right? They're sad, you feel horrible for the family, and the worst part is seeing the shell of a loved one laying in a casket. Well, one woman in Odessa, Texas, took going to a funeral to a whole new level last week when she was caught on camera stealing a ring from a corpse that was laid out at a Texas funeral home. 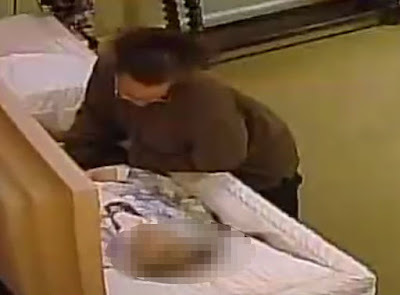 Surveillance footage showed the unidentified suspect appearing to twist the finger of 88-year-old Lois Hicks, who was lying inside an open casket at the Sunset Memorial Gardens and Funeral Home in Odessa on Friday afternoon. The suspect allegedly tore off part of Hicks' skin during the theft. She then fled the scene in her car. Hicks' grieving daughter, Vel McKee, said, "I can't believe someone would be that low." McKee left her mother's side for just 15 minutes when the theft occurred. She continued, "It makes me sick to my stomach. Horrible. I hope they catch her." The worst part is that the thief was reportedly not someone known to the Hicks' family. The Odessa Police Department posted the video footage of the theft on its Facebook page this past Monday in hopes that someone might be able to help identify the jewel thief. Authorities described the suspect as a "heavy set white female wearing a brown long sleeve sweater, black sweat pants and black sandals." Bill Vallie, the funeral home's general manager, said exterior surveillance cameras captured several shots of the wanted woman's vehicle and license plate, however, as of Monday afternoon, no arrests had been made. Anyone who can do this is a disgusting human being with no respect for the dead. It sounds like this lady might have a racket going on by visiting various funerals in the area and stealing jewelry from the dead. Hey! Why not? The dead won't come looking for it.....Or will they? Mwah-hahahahahaha!! !.....Mwah-hahahahahahahahaha!